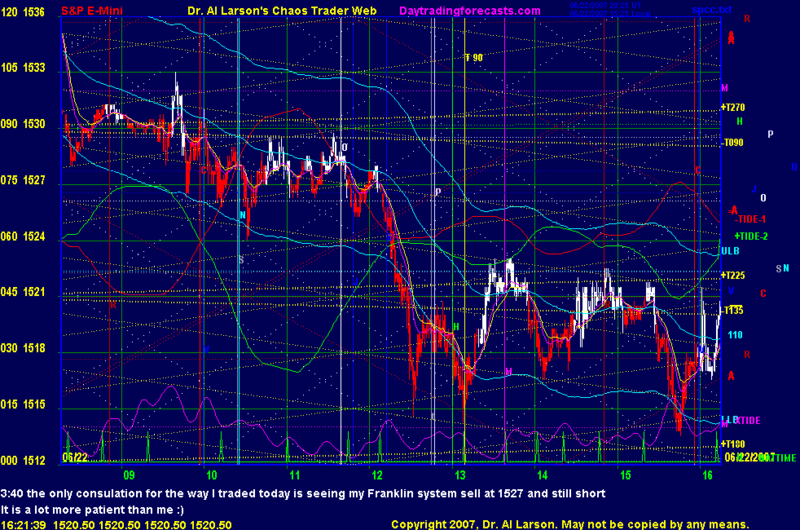 6/22/2007 12:43:32 PM Mountain DCF:: WHAT HAPPENED TO THE BUY AT 1522 THAT I SAW FOR A MINUTE ON THE CLINIC? 6/22/2007 10:47:43 AM Mountain rnt:: AL, can you run the Xtide2 equation over the weekend, its getting near the end of the forecast and its amazingly accurate! 6/22/2007 10:10:44 AM Mountain cgm:: query , sell 156o with 1 sun degree stop? 6/22/2007 9:57:45 AM Mountain cgm:: query: if 1530 solstice time, shouldn't market need to stay above for x period of time to take a bullish stsnce? 6/22/2007 9:54:14 AM Mountain cpf:: Not a sell setting or too far from tide time? 6/22/2007 9:51:48 AM Mountain cpf:: Can we say that we are on red tide? 6/22/2007 9:12:58 AM Mountain cpf:: Thank you Al, it was more my wish due to the slope of 15/20 expecting(mistake) 110 to curl. 6/22/2007 9:04:13 AM Mountain cpf:: Clearly I was wrong! 6/22/2007 8:50:42 AM Mountain cpf:: is not now a ppresetting 15/ 20 close tu tide turn?